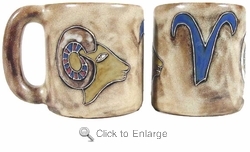 Mara Stoneware Zodiac - Astrology Coffee Mug - Aries is the cardinal / fire sign. Aries people need to keep physically busy. They accomplish many things simply because of their restless energy.